Are you one of those people who just can’t manage to keep a plant alive? Or would you like to combine technology with innovation to keep an eye on your plants? Software engineer Peter Honeder struggled with the problem of keeping his plants alive, so he decided, along with Stefan Oberpeilsteiner, to create a smart sensor that could inform the users of the plant’s needs. This smart sensor is able to measure soil moisture, light intensity, ambient and soil temperature. Using Bluetooth to connect to the user’s phone, the sensor can send notifications to their smartphone whenever their plant needs something, without them having open the app. Helloplant can be used indoor or outdoor for all plant varieties! 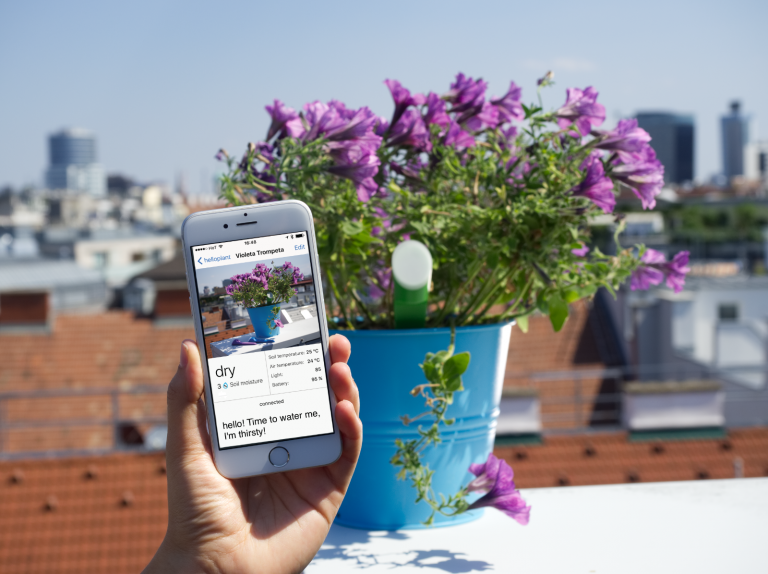 Designed for both indoor and outdoor use, helloplant setup is straightforward: place the helloplant sensor in a planter, take a picture of the plant and name it in the app. Then add some basic information from the plant’s tag. After that, it is ready to go and will alert the user if the plant needs anything. Helloplant doesn’t need internet and there is an optional remote hub, which allows the user to access the sensor’s data if they are traveling and can also connect to Amazon’s Alexa. The technology helloplant uses includes, an ambient light sensor, a capacitive soil moisture sensor and two temperature sensors, one for soil and one for air. Currently helloplant is on Kickstarter with a starting price of $22. The campaign has a pledged goal of $35,704, but has collected a little over $50,000 right now. According to Honeder’s timeline, they will start shipping the helloplant sensors in March 2018. Check out the video below to learn more about this tool for serial plant killers and plant lovers alike.